First day of racing at the Hempel World Cup Series Genoa for the 49er, 49erFX and Nacra 17 classes. First results for the 49er show Tim Fischer and Fabian Graf of Germany winning the first two races to take a one point lead from Isaac McHardie and William McKenzie (1,2) of New Zealand. In third place are David and Lachy Gilmour of Australia. Britain’s James Peters and Fynn Sterritt (17,3) are in tenth place, Chris Taylor and Sam Batten (20,3) are 13th overall. 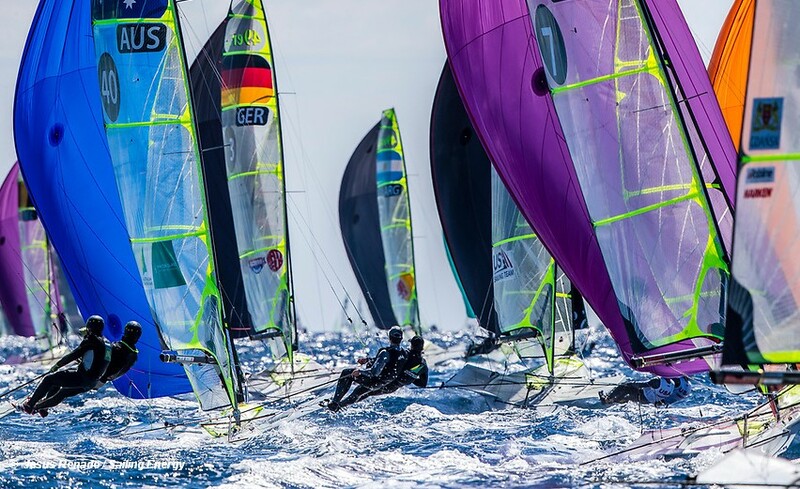 Not a roaring start for Kiwi 49er pair Pete Burling and Blair Tuke on their return to World Cup racing, they sit in 31st place. In the women’s 49erFX, Sweden’s Julia Gross and Hanna Klinga (3,1) have a four point lead ahead of Martine Grael and Kahena Kunze of Brazil (2,6). In third place are Victoria Jurczok and Anika Lorenz (4,4) of Germany. Best placed Brits are Sophie Weguelin and Sophie Ainsworth (2,13)in eighth overall. Isabelle Fellows and Alice Masterman (15,8) are 24th. Ben Saxton and Nicola Boniface won their first Nacra 17 flight race, the other was a win for Lorenzo Bressani and Cecilia Zorzi of Italy. John Gimson and Jonna Burnet were UFD in their first flight. The race win in the second yellow fleet went to Gemma Jones and Jason Saunders (NZL). Nacra 17 second flight results still to be confirmed Tuesday . . .